Oh wow, you guys really make it hard, I just want to try and copy all of your gorgeous projects and decorating, plus I would love to eat all of the fabulous food you cook up. Good thing it is virtual or I would weight 500 lb. Here's a few things from last week that caught my eye. Must Love Junk just amazes me with her talent. Just look at this gorgeous vignette. Feathers and grass, and tons of cute little pumpkins. 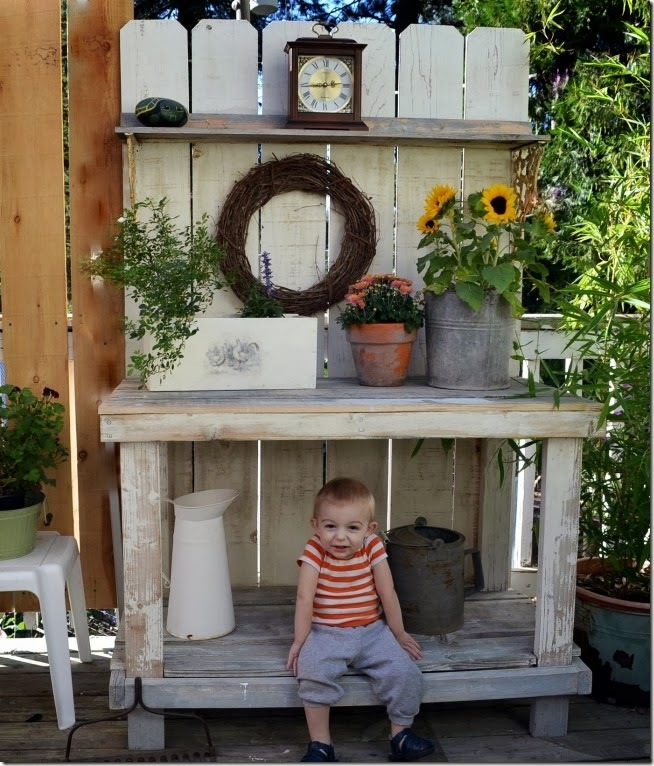 Flower Patch Farmhouse has the most fabulous potting bench, but nothing can compare to her little helper. He is the cutest thing. I just love this picture, it gives me the biggest smile. Totally precious. MsMoozys Open House has created the most beautiful fall decor using tons of her vintage collections. You really need to visit and see it all. 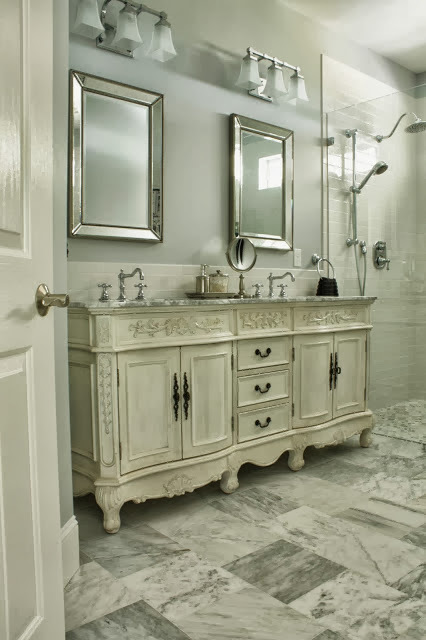 Penny from The Comforts of Home shared the reveal of her master bathroom remodel. It is totally amazing and an unreal transformation. 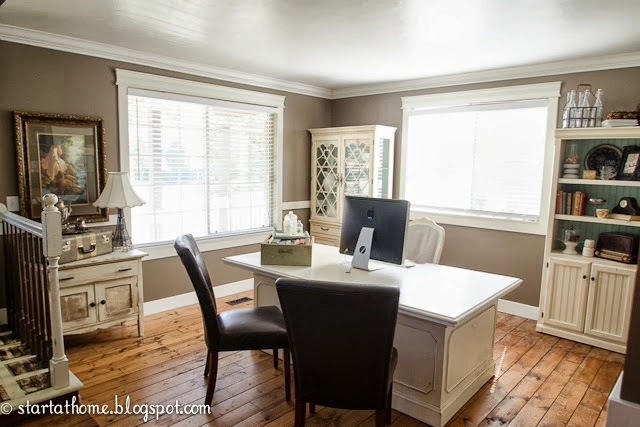 Start At Home changed out her living room for a home office. I love, love, love it. Stunning. Hi Marty. Great features. I'm loving the floors in the living room to office redo. Thanks so much for hosting and hope you have a great week! Thank you so much for hosting, Marty! Hope you have a fantastic week! I love these features Marty. Thanks so much for hosting. Looking forward to looking though all the Fall-inspired links this week. Great features, Marty....thanks for hosting! Hello Marty. Thanks for hosting a great party! Wow those are inspiring posts for sure. Thanks for hosting! Wow thank you so much for the feature! I appreciate it so much. :-) Have a blessed day! Marty, that bathroom reveal is something else, isn't it? The trophies and pumpkins are cute too. Wonderful features. Thanks for hosting. Thanks so much for hosting such a great party every week Marty! It's always a pleasure to link up! I love the bathroom Marty. Thank you so much for this awesome party. Thank you for your sweet and kind visit. Have a wonderful week, sweet lady. Wow, that master bath is amazing! Thanks for hosting Marty! Thank you Marty for hosting such a great link party every week! Love all of your features! It's just the most beautiful time of the year for decorating! Sweet hugs! Hi Marty! Such wonderful features that you chose this week! Thanks so much for hosting your party for us! You are right! So many great link-ups, I don't know how you can choose but I really enjoyed the ones you've picked. Thanks for hosting! Marty, I really like the posts you selected to feature. Each one, fantastic! Thanks for hosting. Oh, Marty that is such an adorable picture, he certainly out shines the potting bench...great features too! Gorgeous features Marty! Thanks so much for hosting and happy Tuesday! Happy October, Marty! Thanks for hosting. Marty, thank you so much for featuring my master bath redo! I am honored to be amongst all the other wonderful featured posts. Thank you for hosting this party every week! Beautiful and lovely as always-such a treat to join you! I'm with you Marty! Your party goers contribute never ending inspiration. So much beauty to see at this party and I thank you for hosting it week after week. You are awesome! I really like your new look, Marty. You are such a pretty lady! Thanks so much for hosting! That little boy is so darn cute!!! WOW...awesome creations! Hi Marty, thanks for hosting! beautiful features! Wow, what great features! I'm a little late to the party, Marty...I'm a poet and know it! Sorry...that was lame, as the kids would say! Looking forward to another great one. Wow! Your party sure is big tonight....I've got a lot of "esplorin'" to do! thanks for hosting, Marty! Thank you so much for hosting Marty ! Have a great week ! Hi Marty, love all of the features, and your Faudree collage, great job! Thank you so much for hosting. Thanks for hosting, Marty. Have a great week. Hi Marty, Thanks for hosting a wonderful party!! Love all the features! I'm happy to participate to your linky party for the first time with my French blog. I'm pleased to be your newest follower (LE CHEMIN DU BONHEUR) and to like ou of course on facebook. Thank you Marty for hosting this fabulous Linky Party. I'm looking forward to browsing through all the creativity in here. P.S. I couldn't find your Grab Button - I hope I linked the right graphic onto my post? Thanks for hosting Marty! Lots of great fall looks here! Thank you so much for the special invite to this wonderful Link Party! I am delighted to be asked and have joined in on all the fun! Can't wait to take a few minutes to visit and see what everyone has been up to! So many gorgeous posts to read and too little time! Thanks for hosting! Thank you for the special invite! What a wonderful party and lots of GREAT entries. Will be adding your party to my side bar and will each week. Do you have a party Button for my side bar? I found the Featured Button but can't find a party button.